Donald MacNaughton has worked as a coach specialising in the mental side of performance with athletes in elite sports over the past 14 years. Through the Kris Boyd Charity, Donald will be offering educational courses and on line workshops for adults on getting your “head back in the game”. One of the courses Donald will be offering is Brain Science 101, which teaches how the brain works under pressure and helps you to make sense of your behavior’s and reactions when anxious or down. As well as putting a plan in place to get on a more forward path. Learn the relationship between your thinking, emotions and behavior’s, and how to put a plan into place to recognise destructive thoughts that are affecting your life, and actions for how to resolve these issues. Learn practical physical exercises to help find your confidence in challenging times, allowing you to be able to respond more appropriately and effectively under pressure. – Help develop your resilience to external factors. – Learn the power of listening when a friend is going through a hard time, when to offer advise and when to just listen. 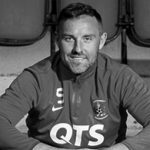 The Kris Boyd Charity is not a substitute for medical intervention, but an educational resource whose intention is to help people coach themselves, or people around them when going through mental and emotionally challenging times. The Kris Boyd Charity has been set up to help those suffering with mental health issues, so they can find someone to talk to and get help. I consent to The Kris Boyd Charity collecting my details through this form.